My first thought was to switch from rest to csom so that I could batch all the requests together and get the validation data in a single call. But then I began to think ‘Why not just send it down with the initial page?’ I thought about writing a custom webpart that could get data from an SPDataSource and serialize it to JSON and write it to the output stream. As an added benefit I can now filter the data send to the browser by editing the XSLTListViewWebParts, adding/removing columns, setting filter criteria etc. The Image below shows a sample JSON object called MAP_Contracts that was generated using this XSLT. Note that the generated object has an array called rows that contains field called values that contains the data. 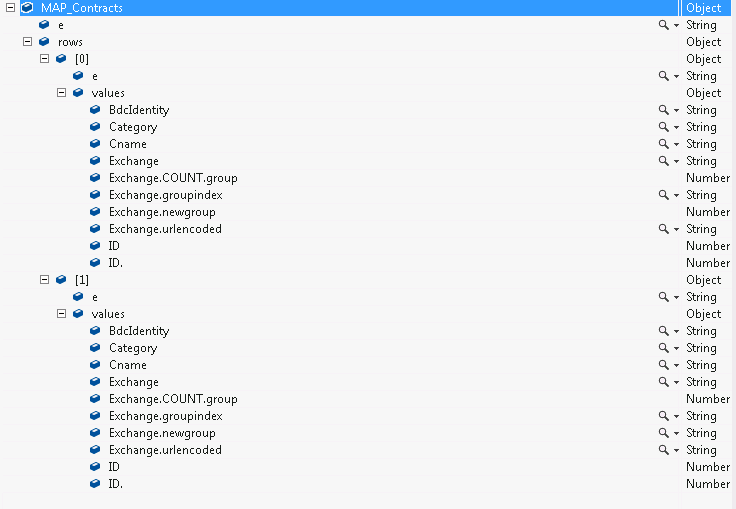 In this example I have grouped the view on Exchange so the fields Exchange.COUNT.group, Exchange.groupindex, Exchange.newGroup and exchange.urlencoded were added by the webpart and could be used to do grouping on the client side.